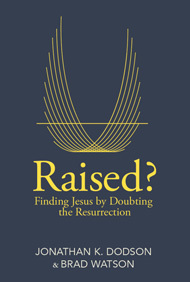 We wrote this short eBook Raised | Doubting the Resurrection for several reasons. We wanted something brief and readable to give away to skeptics. After all, the notion that a man rose from the dead is pretty incredible! We want to promote more gospel thinking on the resurrection for discipleship. After all, if Christ is not raised we are still in our sins. We wanted to bless the churches with a short, deep, practical and very readable book on the resurrection they could give away on Easter. We are so taken with power of the resurrection to change, not just our present, but also our past and future, we couldn’t help ourselves. We felt a genuine prompting from the Holy Spirit. I was supposed to release a book on practical disciple-making but he redirected us to this! We are so moved that Jesus death and resurrection becomes our death and resurrection by faith alone in the risen Christ alone! If you go to the site, there is artwork to download so that your churches can let everyone download it on the spot in your services. Go to www.raisedbook.com. We are praying for you, your churches, that the power and grace of the resurrected Jesus would suffuse your lives and Easter gatherings. The Lord is Risen!